Our Lady of Guadalupe for sale. This is my new oil painting fresh off the easel. The original of the Virgen de Guadalupe is still wet but you can purchase a beautiful print on canvas or Our Lady of Guadalupe for sale. I painted this beautiful image of the Vergin de Guadalupe on canvas in my own way. This is my own version of this famous painting but based of the original old painting from the Nuestra Señora de Guadalupe, which is enshrined within the Minor Basilica of Our Lady of Guadalupe in Mexico City. The basilica is the most visited Catholic pilgrimage site in the world, and the world’s third most-visited sacred site. I love this Madonna and I love to paint Madonnas in my own colors. This is not the exact copy, but is very similar and in more vivid bright colors. I hope you will like my painting. 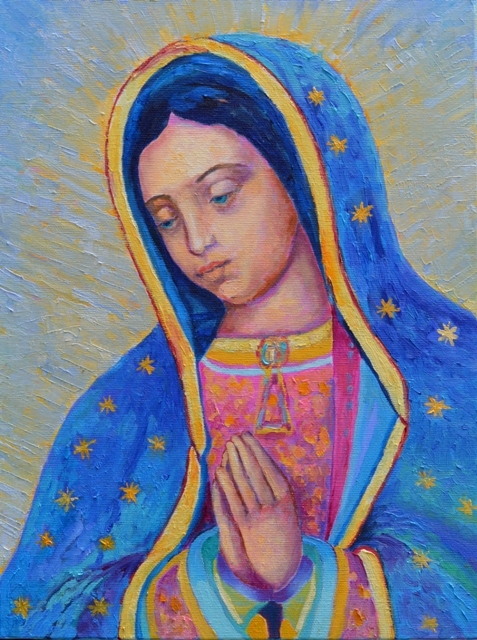 Here: the original oil painting of Our Lady of Guadalupe. SIZE of Our Lady of Guadalupe canvas print: 45 x 60 cm (18 x 24 inch).